Once the excitement of ‘sacking the boss’ has subsided, you may feel yourself torn between feeling incredibly liberated or terrifically terrified! No longer do you have anyone telling you what to do and much like a child moving out of his parents’ home for the first time, once the feeling of liberation has passed, you could feel a little adrift. Luckily, you’re not alone and, even better, all it takes is a shift in mindset to see you on the right path to becoming the successful entrepreneur you know you can be. Learn how to set your own priorities and take complete personal responsibility for all of your actions. Make every decision consciously, as there’s no one to point the finger at once the results come in, except you! This is your business. Generally employees are given training related to their job. As a business owner, you need to determine your own ‘entrepreneurial curriculum’ and become master of all aspects of your business. The great news is that there is a wealth of successful Distributors to learn from in this business. Make sure you attend your local meetings, as well as the company showcases. It’s here where you can immerse yourself in a room full of big thinkers and it will help your positive mindset. Successful Distributors know how to get good results, so ask good questions and soon their business tips will be yours! “Success leaves clues, and leaders and high earners never miss an event, for the team energy, the team spirit, the inspiration, the information, the excitement for our futures. You can’t wait for things to happen. Yes, learning to earn is vital and an ongoing factor for business success, but to get the results, you need to take action – every opportunity you can. No one’s there to make you do anything, so it’s up to you to wake up with a plan every day and implement it. As an employee, when given a task, as long as it’s up to standard you’re doing your job. As an entrepreneur, this mindset is no longer good enough. 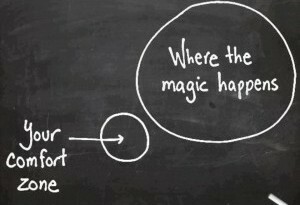 If it’s not moving you closer to where you want to go, you need to put more into it. Focus on the outcome and not just completing the task. Being your own boss isn’t always easy and every now and again you’ll find yourself faced with something you don’t want to do. You’re taking on every role in your company, remember! The entrepreneurial mindset means you have to push yourself beyond what you’re used to. Face your fears head on, though, because doing a task you fear is another step closer to achieving excellence! Every Kleeneze Distributor has, at one point, faced criticism from friends or family. So rather than try to explain, why not show them! Results will speak far louder than anything you could say, so get out there and create your success story. The rest will follow. It’s time to change your mindset to see yourself as the business owner you want to become. In a day-to-day job, it’s easy to get sidetracked with the minutiae of ‘getting things done’ – ensuring every little detail is perfected. We’re not suggesting that you ignore those essential details, but try not to spend time on dotting every ‘I’. If you want big success, you need to spend time on big things! Look ahead to every opportunity and grasp it. This is your business and you’re working towards that big picture.